With little good economic news or direction from Washington, the pessimism on Wall Street intensified Monday, sending stocks lower. The market seesawed early in the session as investors were torn between hopes for the financial industry and fears about the broader economy's slide. But stocks turned moderately lower in the afternoon, following a now familiar pattern where short-lived bursts of optimism give way to concerns about the country's economic woes. Financial stocks, however, were the one exception, maintaining their early gains as other industries faltered. Banks rallied on a news report that Bank of America could raise capital in the private sector. Shares of major banks have been pummeled to multiyear lows amid growing concern that they don't have enough cash to cover future losses despite multiple government rescues. Among the day's downbeat news, newspaper publisher McClatchy Co. said it plans to eliminate 1,600 jobs, or 15 percent of its work force, as it battles declining advertising revenue. Investors were also mindful of remarks from billionaire investor Warren Buffett, who said during an appearance on CNBC that the economy has "fallen off a cliff" over the past six months. He noted that consumers have changed their habits in remarkable ways. 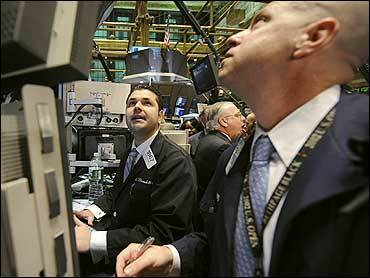 According to preliminary calculations, the Dow Jones industrial average fell 79.89, or 1.21 percent, to 6,547.05. The Standard & Poor's 500 index fell 6.85, or 1.0 percent, to 676.53, while the Nasdaq composite index fell 25.21, or 1.95 percent, to 1,268.64. "This market is rudderless," said Jon Biele, head of capital markets at Cowen & Co. "There's a complete lack of direction. I think (investors) are just trading positions." "Any type of news we get, the market is just skeptical," he said. "There is nothing in the near term that is going to ratchet us to a different higher level." Earlier Monday, drugmakers Merck and Schering-Plough announced a $41 billion deal. Merck & Co. has offered Schering-Plough shareholders $10.50 in cash and just over half of one Merck share for each of their shares. The price represents a 34 percent premium to Schering-Plough's closing stock price on Friday. While a combination between the two companies had long been speculated, news of the merger was nonetheless a good sign that big deals can still get done in this environment. The Wall Street Journal reported that Genentech's board is close to striking a deal for a $95-per-share sale to Switzerland-based Roche, the company's cancer drug partner. Genentech rose $1.92, or 2.1 percent, to $92.78. GM rose 20 cents, or 13.8 percent, to $1.65. Chrysler isn't publicly traded. Bond prices were mixed. The yield on the benchmark 10-year Treasury note, which moves opposite its price, slipped to 2.87 percent from 2.89 percent late Friday. The yield on the three-month T-bill, considered one of the safest investments, rose to 0.20 percent from 0.18 percent late Friday. Light, sweet crude for April delivery rose $1.55 to $47.07 a barrel on the New York Mercantile Exchange. Overseas markets were mixed after the World Bank forecast that the global economy will shrink this year for the first time since World War II. Japan's Nikkei stock average fell 1.21 percent, while Hong Kong's Hang Seng index dropped 4.84 percent. Britain's FTSE 100 rose 0.3 percent, Germany's DAX index rose 0.7 percent, and France's CAC-40 fell 0.0 percent.